This couple built a custom getaway for all seasons to eventually become their permanent home. 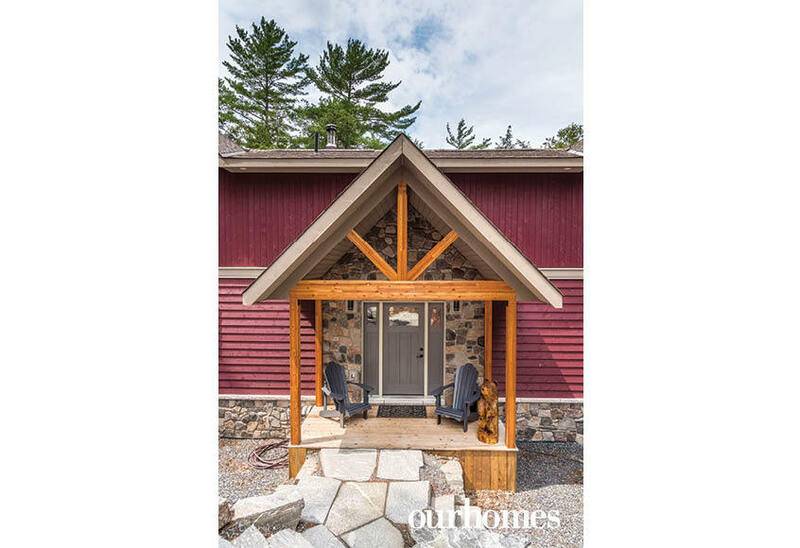 A version of this article originally appeared in the Fall 2018 issue of OUR HOMES Parry Sound Muskoka Huntsville Haliburton, p.86. Find local businesses in our Muskoka directory. 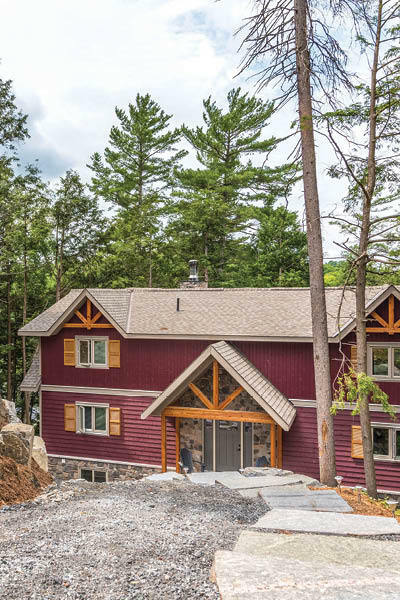 Ron and Karen Heyden's new cottage on Lake Vernon is an all-season retreat they'll eventually call home. Ron's parents first bought a cottage on Lake Vernon more than 50 years ago and he has spent most summers and winters at the lake since age three. Ron and Karen began planning their own lake house when a vacant lot next to the original cottage came up for sale. 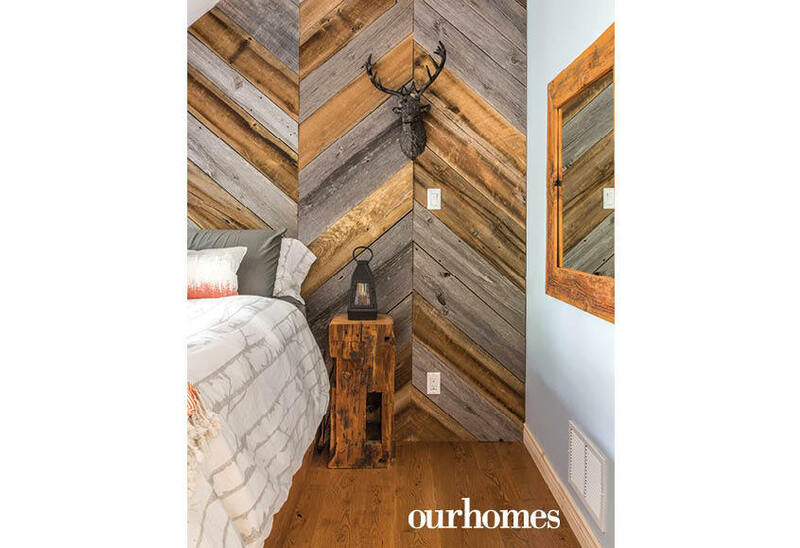 The couple looked at the work of several builders and settled on Linwood Custom Homes’ Antler Trail design. They loved the open-concept design, main-floor master bedroom and plenty of bedrooms and space for family and friends. The property, like much of the Vernon Shores area, is steep granite that had to be blasted for the building foundation. They chose siding in a shade called Gooseberry, which contrasts nicely with the natural finish of the home’s wooden shutters. 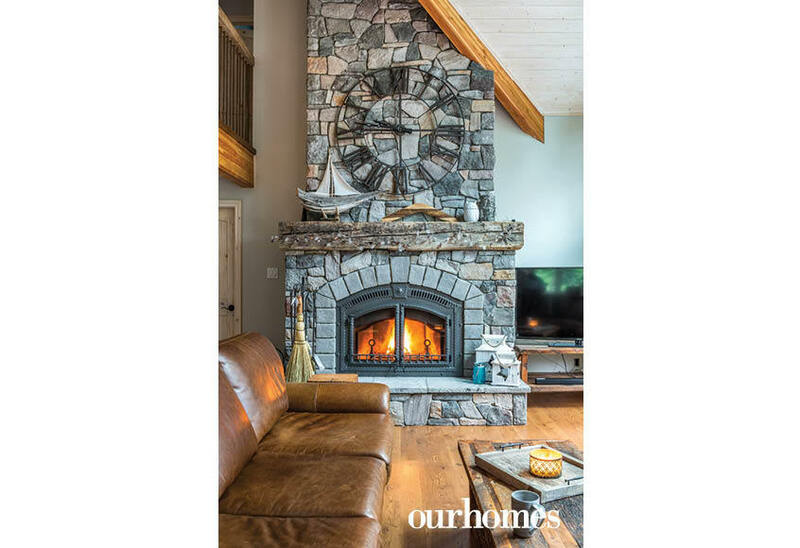 In the great room, with its high windows looking over the deck and a surrounding natural screen of tall pines, Randy Nickason of Fireplace King installed a Napoleon wood-burning fireplace to heat all three levels of the home. 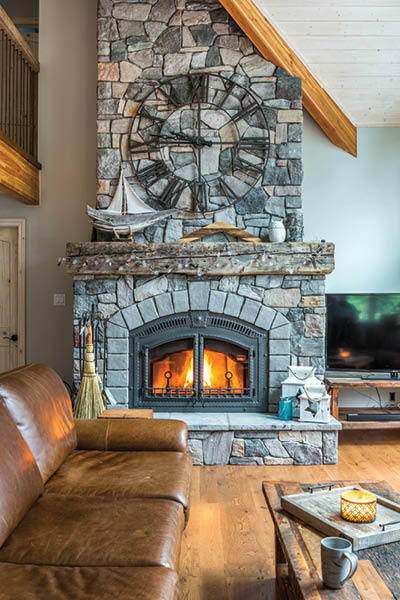 Masonry King’s Peter Zantingh finished the fireplace and cottage with more than 600 square feet of stonework. Custom corner cabinets for the dining room, as well as furnishings in the bedroom were created by The Cutter’s Edge. 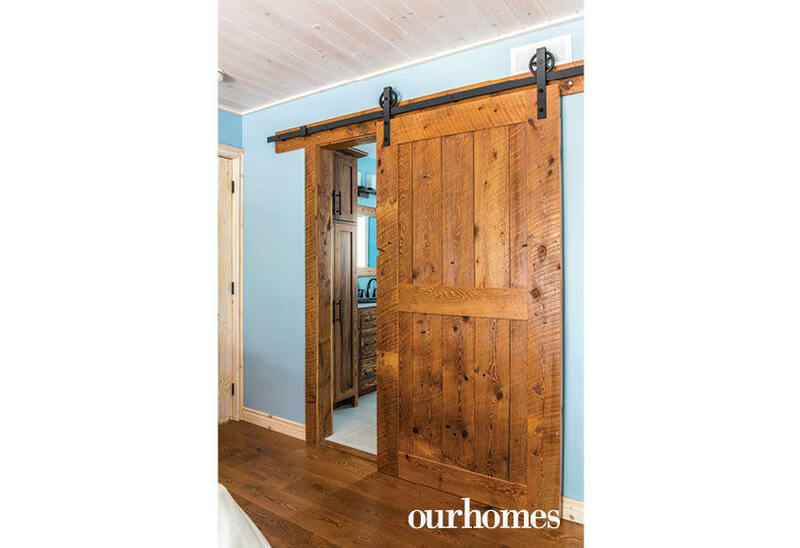 In the master bedroom, the couple installed a sliding barn door to access the en suite. Ron used his electrical expertise to design and build a barn-beam chandelier. He installed a row of Edison bulbs on a reclaimed barn beam suspended above the dining room table. 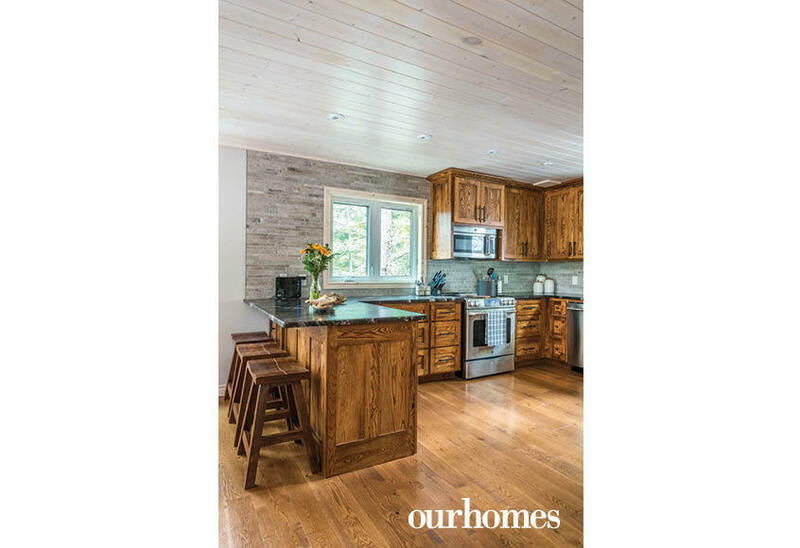 The spacious cottage kitchen is furnished with Ontario-grown, wormy ash cabinetry and a leathered granite kitchen counter. The backsplash tiles run from the countertops to the ceiling. A stone footpath and stairs meander downhill to this cottage’s front door. Clad in siding stained Gooseberry, the bright building contrasts with the surrounding green pine trees. 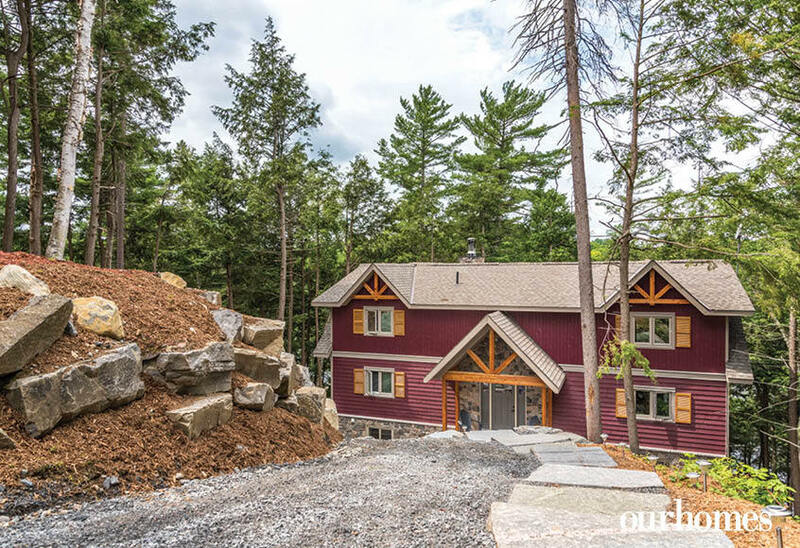 Post-and-beam construction is one of many attractive features in this cottage by Linwood Custom Homes. A carved bear greets visitors. 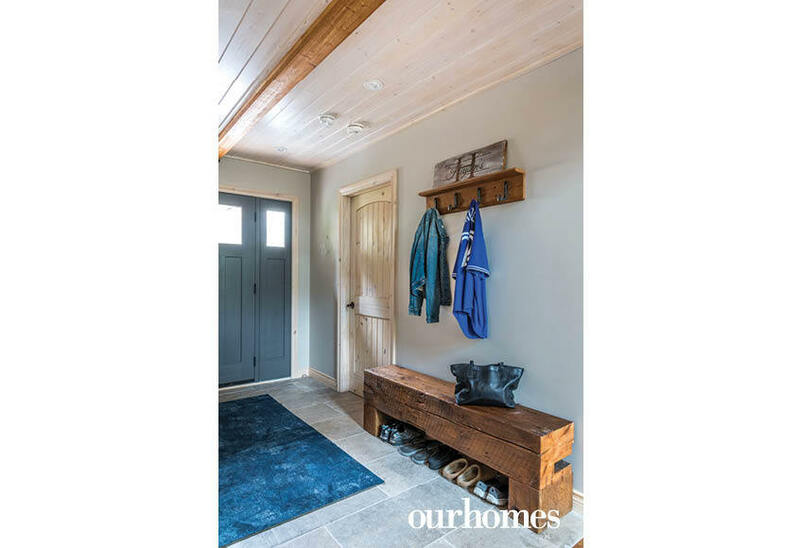 An old barn beam is upcycled into a sturdy bench at the front entrance to this cottage. A tongue-in-groove ceiling is whitewashed to brighten the space. 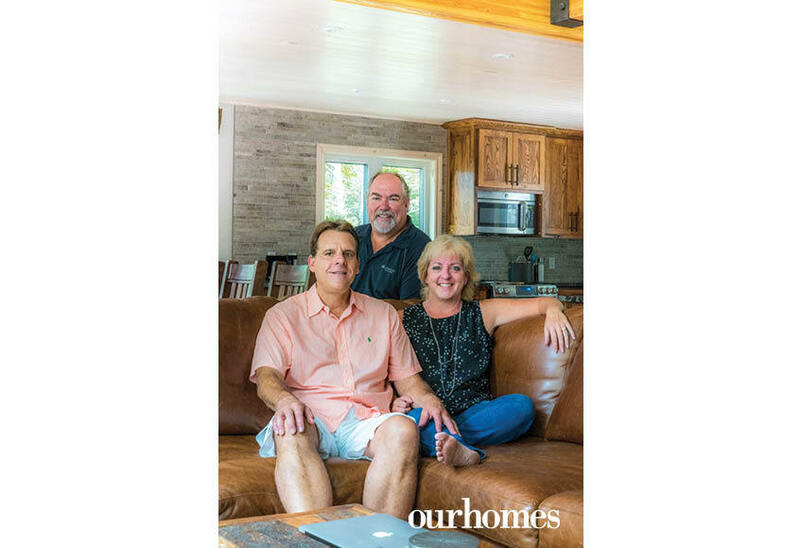 Cottage owners Ron and Karen Heyden with Linwood Custom Homes vice-president Craig McFarlane (centre). 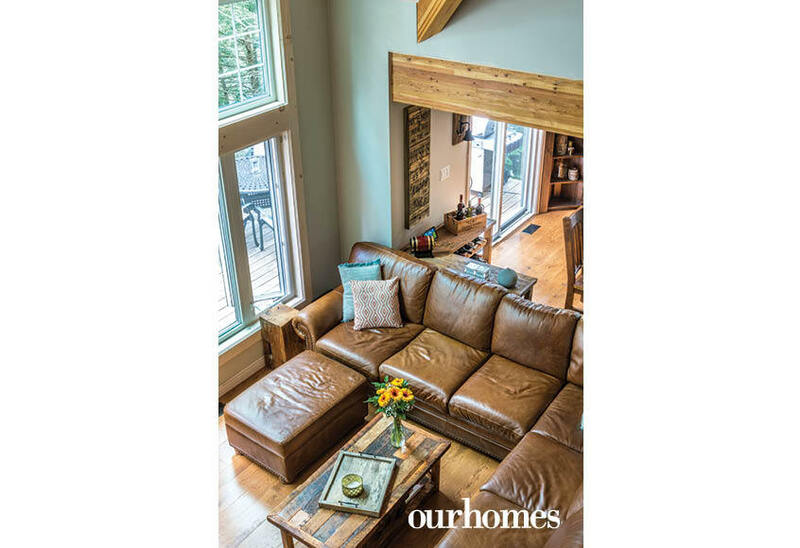 Seen from the second floor, a soft leather sectional makes an inviting spot to sit in front of the fire. 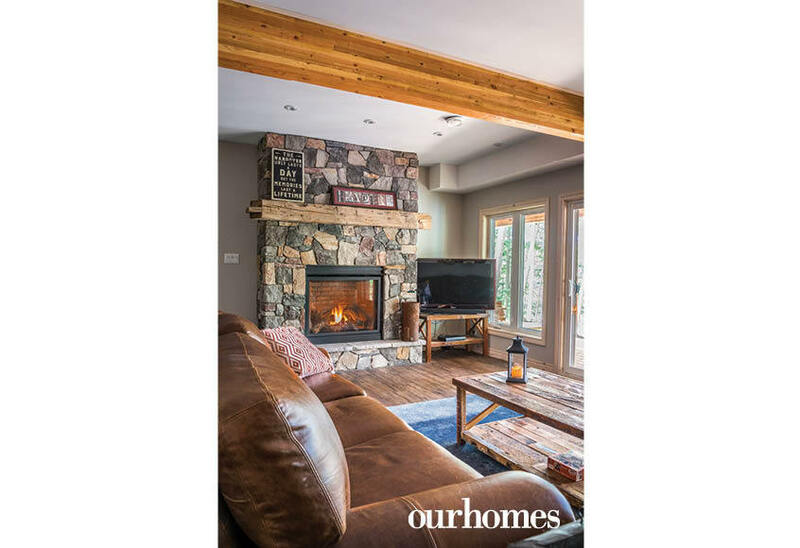 The wood-burning living room fireplace is one of the family’s favourite places to gather. An oversize clock has presence while letting the stone shine through. 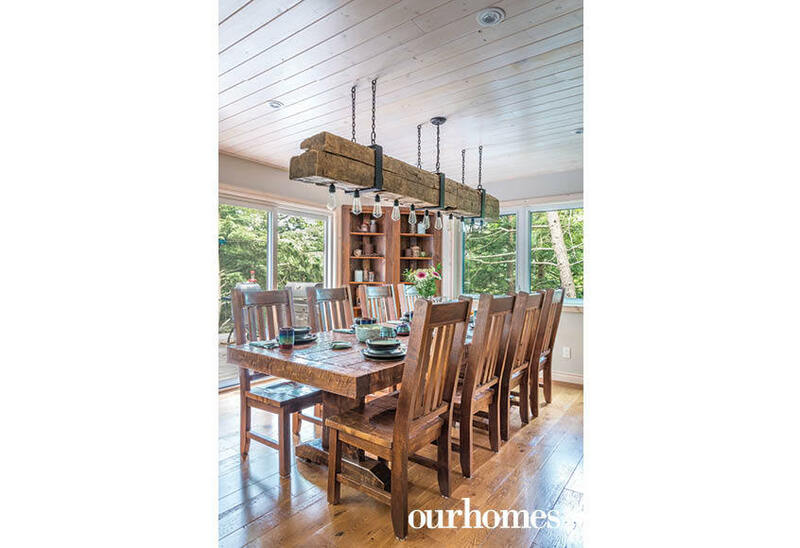 A reclaimed wooden beam rescued from an Ontario barn forms the base of this one-of-a-kind chandelier. 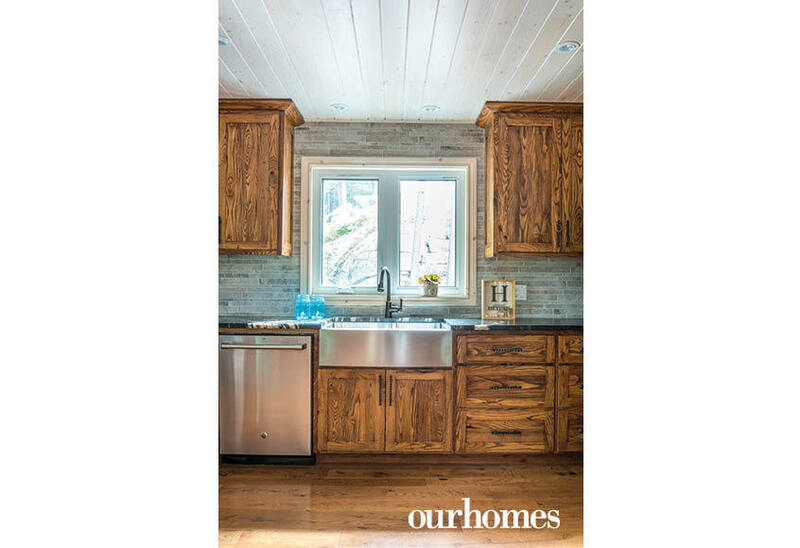 Oak flooring complements the wormy ash kitchen cabinetry and bar stools. A leathered granite counter and light grey brick-style backsplash brings the tones together. The grey tile backsplash reaches from the leathered granite kitchen counter to the ceiling. Wormy ash cabinetry offers almost a graphical feel. 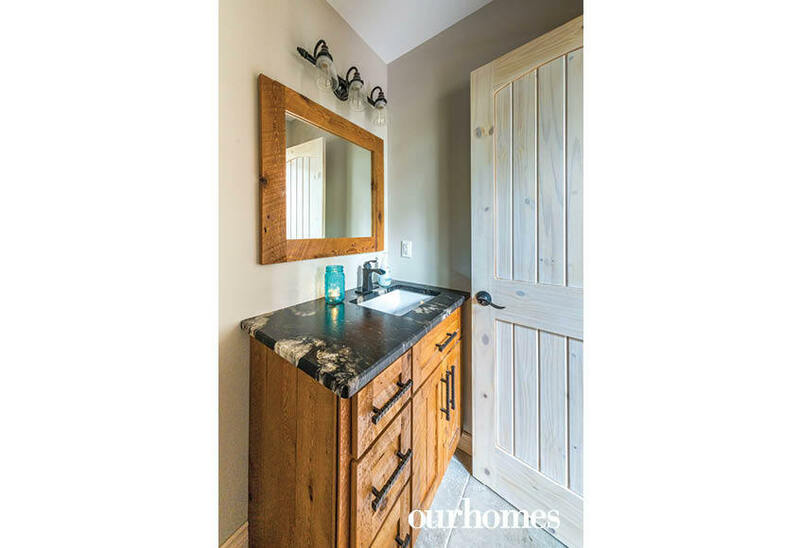 Leathered granite covers the top of this vanity in the powder room. The main floor master bedroom has a sliding door that opens to the front deck. Tongue-in-groove boards on the ceiling are whitewashed. Installed in a chevron pattern, reclaimed barn board and a barn beam night table lend a rural look to this bedroom. 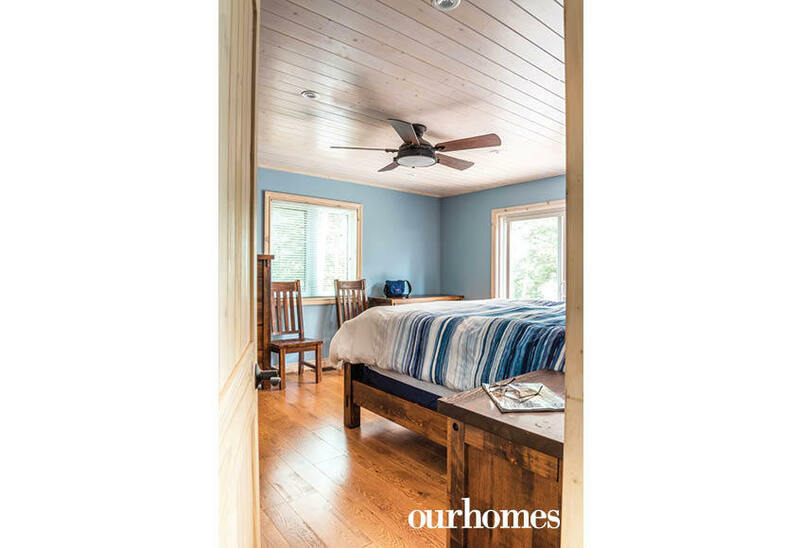 A custom-built wooden door rolls open to the en suite in this Lake Vernon cottage. 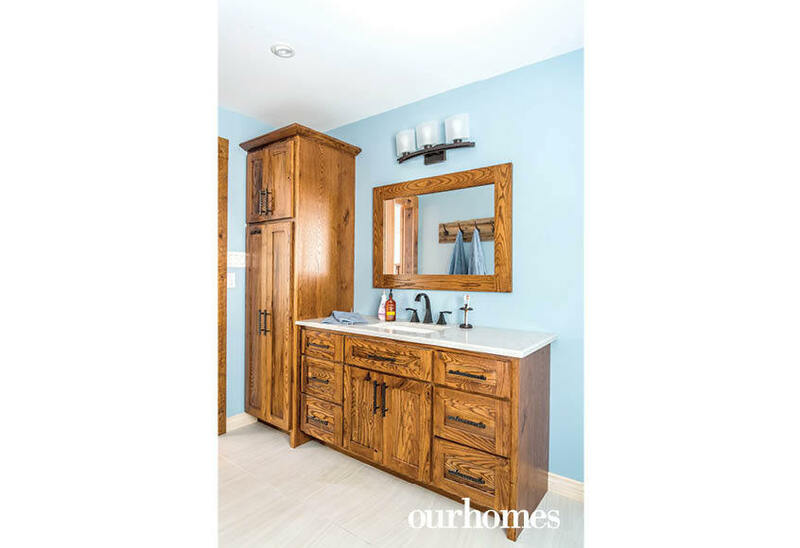 The bathroom vanities and cupboards are built with wormy ash wood, which offers a beautiful grain pattern. Pale blue walls offer serenity to coordinate with the master bedroom. 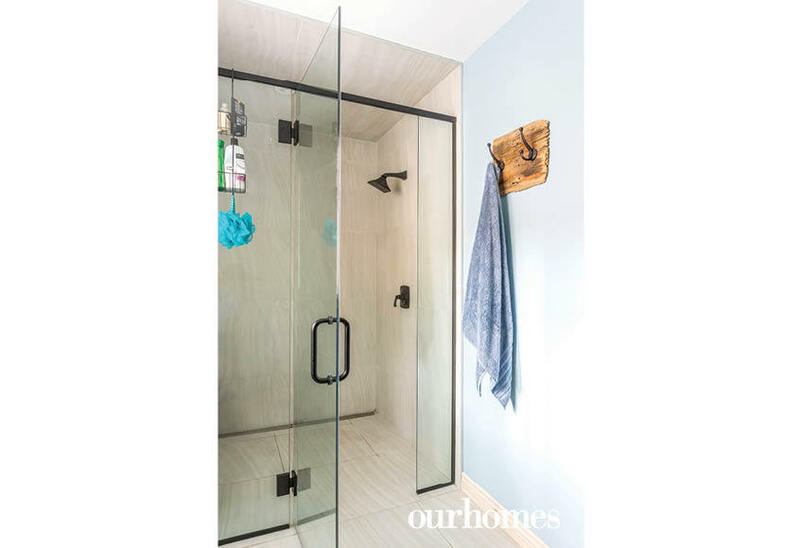 A glass-walled shower door with black trim and a linear drain create clean lines in the bathroom. The comfortably furnished ground floor family room has a fireplace, lots of windows and sliding doors that open to the front of the cottage. 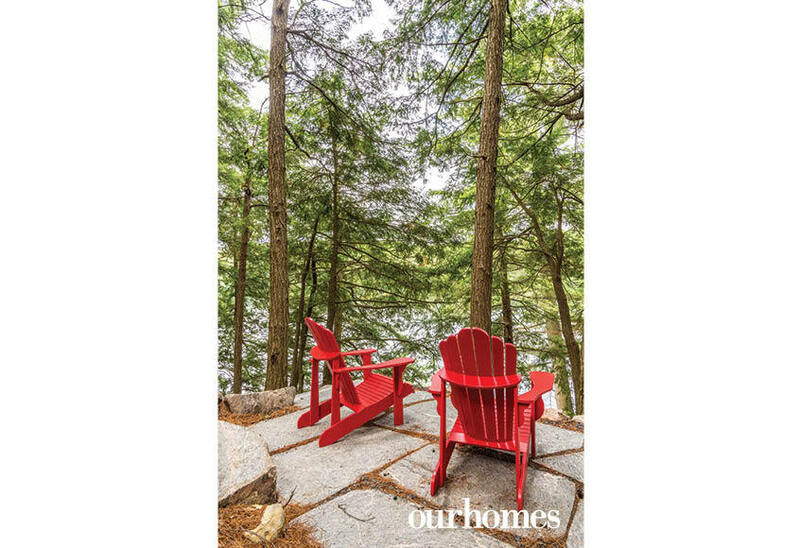 Muskoka chairs make an inviting resting place on the stone path to the lake. 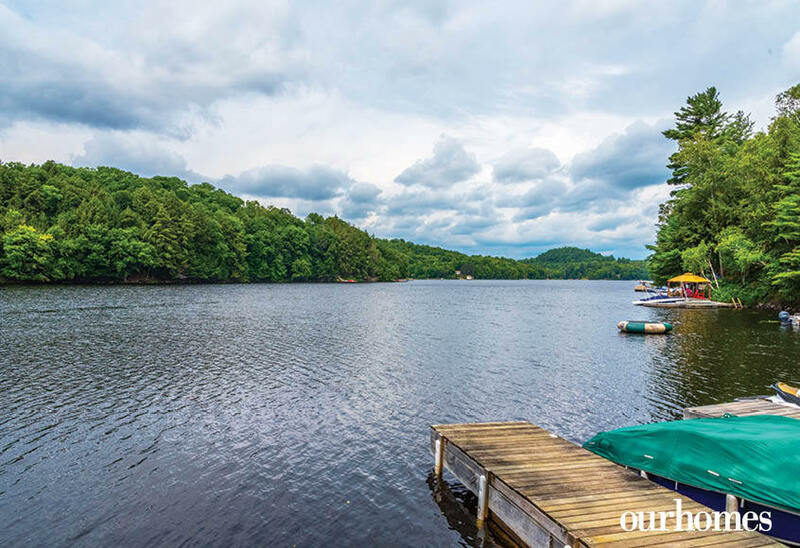 Lake Vernon provides easy access all the way to downtown Huntsville.